After the success of the 2017 ‘CloseUp & Friends Tour’, this October (25th/26th)/November (1st/2nd) they are taking the CloseUp show on the road once more for their most adventurous tour to date. 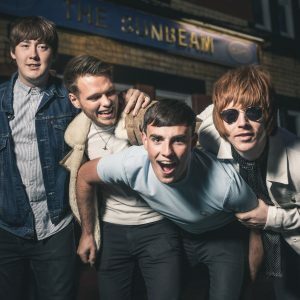 Combining artists they work with/promote regularly for stellar emerging line-ups in some of the UK’s most reputable music obsessed cities. 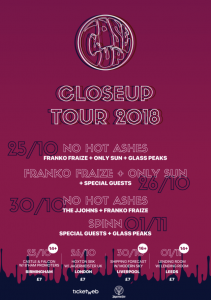 With colossal, interchangeable line-ups set for Birmingham, London, Leeds & Manchester in conjunction with many of the UK’s most exciting indie/electronic artists being on board, they cannot wait for 2018’s CloseUp Tour. They will again be teaming up with regional musical powerhouses/associations* to ensure these shows are in keeping with the true CloseUp style, offer a unique, absorbing experience for all of those in attendance. With their pals at Jagermeister supplying the drinks, DJ’s every night & more, the CloseUp Tour is set to have a real party atmosphere, don’t miss it.